As some TPG group numbers fall. Vodafone has stopped marking the speed of its NBN plans as variable, falling into line with most other retail providers in publishing “typical” performance numbers. The telco, which has been offering NBN services for a bit over a year, provides the numbers in a ‘key facts sheet’, something the Australian Media and Communications Authority (ACMA) now requires all retail service providers (RSPs) to publish. Prior to this, Vodafone had simply said that speeds on all its NBN plans vary. Its typical speeds are close to the consensus that emerged among RSPs by mid last year. The consensus, based on self-reported figures from providers, was that users would see typical speeds during the 7pm to 11pm peak of 46Mbps on an NBN50 plan and 80Mbps on an NBN100 plan. iTnews has continued tracking these typical speeds since, but there have been few noteworthy movements. Vodafone’s switch to actually providing an indication of speeds is one movement worth noting. The other is the decline in typical peak hour speeds reported across the TPG group of companies. This is most pronounced on the higher tiers; iiNet, TPG and Westnet saw typical peak speeds on the NBN50 tier fall by 3.3Mbps between September 2018 and now. On the NBN100 tier, TPG’s reported typical evening peak speed fell from a peak of 80.2Mbps to 71.4Mbps, an 8.8Mbps reduction. Similarly, Internode’s NBN100 typical speeds fell from 80.5Mbps to 72.7Mbps, a 7.8Mbps decline. That could make the next official measure of NBN speeds - the Australian Competition and Consumer Commission’s quarterly monitor - interesting reading. In the last set of ACCC measurements, taken during the month of August 2018 and released in November, “the RSP with the fastest broadband … was TPG”, delivering 88.4 percent of the advertised topline speeds to a sample of NBN users in the evening peak. At 88.4 percent, the figure was higher than even the expectations set by TPG’s self-published numbers. 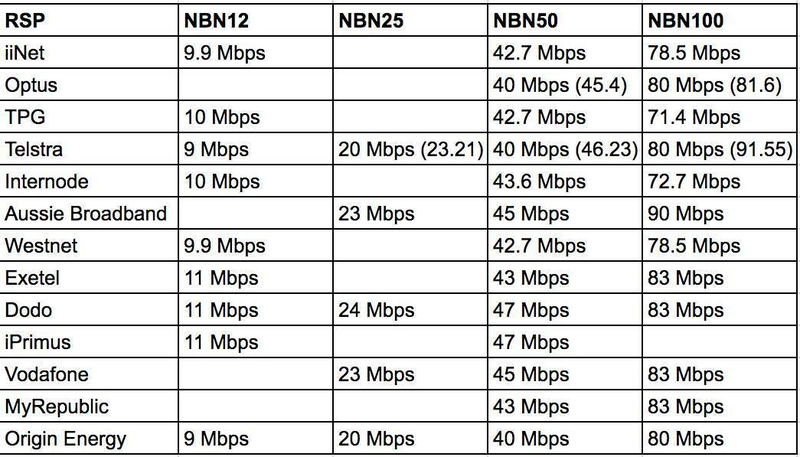 Given there’s already a disconnect between the different ways NBN speeds are reported by different parties, it’s unclear what impact - if any - the self-reported downgrades might have on these other sources of speed numbers. One possible explanation for the reduction in advertised peak speeds is the removal of a free connectivity virtual circuit (CVC) boost that RSPs and their customers had been enjoying through last year. As previously reported, RSPs were receiving a large bonus in CVC that was being shared by all users on an RSP’s network. That bonus - which came as part of a temporary price offer - is now expired. It’s not clear if this is the reason for any reductions, but the timing - and known effect of the price offer expiry - present as a possibility.